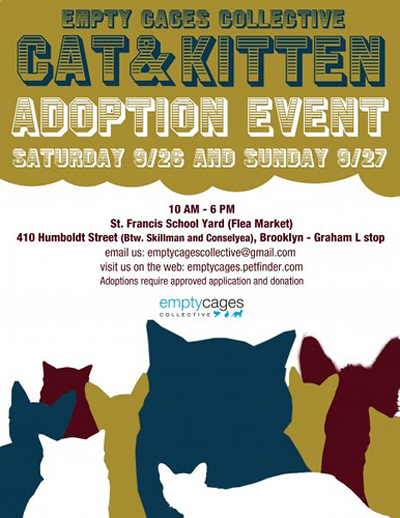 Yet another contender in this jam-packed weekend has come to my attention: Empty Cages Collective will be having a two day adopt-a-thon at St. Francis School stating tomorrow, September 26, at 10:00 a.m. Even if you are not in the position to adopt a pet why not swing by, say hi and give these adoptable cuties a belly rub or two? And as always, these folks can always use volunteers and donations. To learn more about Empty Cages Collective and how you can help click here and you will be directed their web site.